We returned to Amoenitas in Rebak Marina, off Langkawi late in Aug'11 after a most enjoyable stay at our New Forest, UK home. Though we have owned Greenacres for forty one years we have not seen much of it whilst away cruising for the last thirteen. In 2010 we spent considerable time there doing serious internal refurbishment, so imagined that on this trip back we would be reaping the rewards of our previous efforts with a more relaxing schedule. Wrong again, we became enmeshed in more serious renovation, this time of the garden. Still it was a good summer and we tackled a number of big tasks in former no-go areas of our two acre plot such as the back of the garage which had been a repository of building and other waste since long before we moved in. So, we decided that after nearly five years of fabulous cruising and traveling in SE Asia, the time had come to move on. We are particularly keen to get closer to our family, especially our four grandchildren who are growing up apace. The thought of them coming aboard with us in the Med was a clinching factor. That decision taken, all that remained was to choose how to spend the five months remaining before Amoenitas would be loaded aboard the vessel in Phuket for transportation to Marmaris in Turkey. Having done a pretty good job of touring Asia, exploring Indonesia, Singapore, Malaysia, Cambodia, Thailand, Laos, Vietnam, China, Tibet, Nepal and India, all that was left was Myanmar, Pakistan and Bangladesh. Enthusiasm for the latter two being lacking, we decided that we must see Myanmar, formerly Burma, before we leave. Prior to that though, we resolved to tick-off one more box on the Indonesian island of Sumatra. 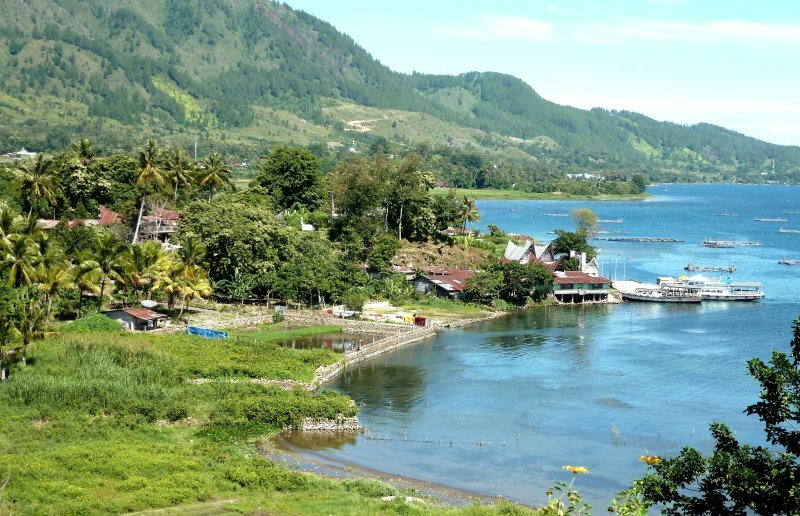 We had read of Lake Toba's near disastrous effect on the world's population and as it was in central Sumatra, just across the Malacca Strait, thought we should pay a visit there last September to chill-out. Though just a short flight from Penang, you end up in Medan, a sprawling mess of a city of three million souls. From there it is a five hour trip by horrendous roads to Parapat, a ferry town on the lake shore. The only compensation was that the road was so poor and badly congested that the journey time was the same by sports car or lumbering bus. Toba's notoriety stems from the volcanic 'super eruption' that occurred some 75,000 years ago which ejected so much material into the west blowing winds that virtually all the population on three continents were wiped out. Scientists have estimated that a total world population of around 2 million was reduced to around 10,000, those surviving mainly in Africa. 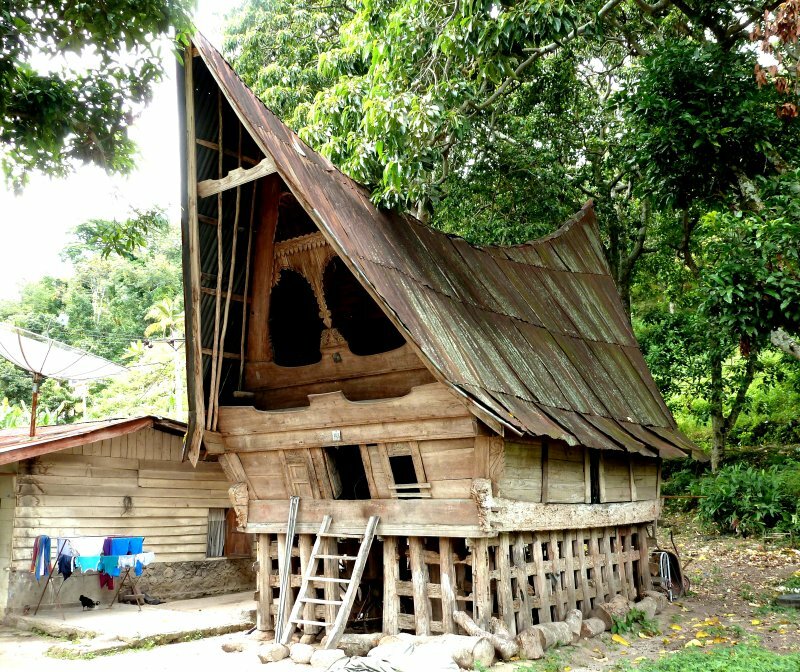 This area is home to the Batak people who live in characteristically roofed houses, maintaining their strong cultural traditions and crafts such as wood carving. The big attraction for us was a retreat from the hot, muggy, huddled masses to a climate that in spite of being only 2° north of the equator, at an altitude of over 900m was somewhat akin to a good English summer's day. There were few visitors, lots of good restaurants and a spacious hotel room overlooking the lake. The lapping of the waves on the shore accompanied the dulcet tones of the computer keyboard, as the place rather unusually had a half decent WiFi. We enjoyed two blissful weeks of walking and exploring the one road around the crater base on a hired motor scooter. It was on one of these excursions that we came across a tented throng beside the road that turned out to be a village funeral. Dave couldn't resist taking this photo of the dear departed as shortly before, Di had been engaged by one of our grandchildren about death. The conversation began by saying that, as she was really old, surely she would shortly be consigned to a box. This was followed by questions as to how she could be fitted into a box.... was the intention to fold her up! Back at Rebak we readied Amoenitas for another season with the added requirement of a survey, requested by our insurers as she had her twentieth birthday last April. Unsurprisingly, she came through it with flying colours. Another local distraction every two years in early December is LIMA (Langkawi International Maritime and Aerospace Exhibition) that is held at Langkawi airport just 2km from the marina. It is the Farnborough of SE Asia with strong representation from Malaysia, Singapore, Indonesia, India and Thailand. The world's military and small civilian aircraft suppliers put on lavish displays of ground exhibits as well as breathtaking aerobatic displays. 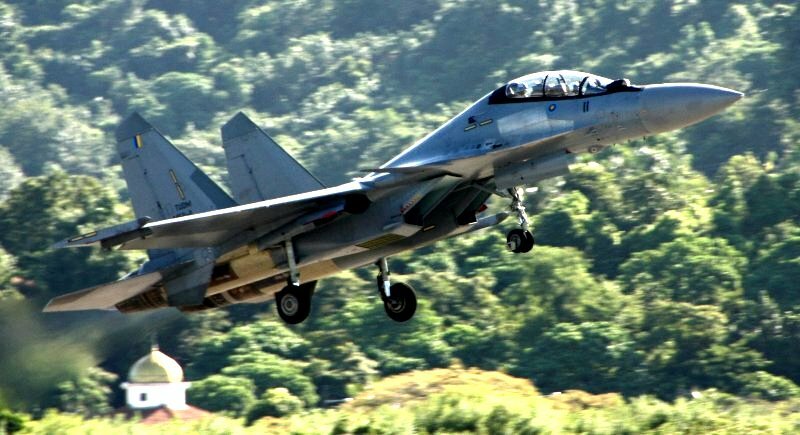 A sign of the times is that all the local front line fighters are Mig29s or SU30s. Above, one of the latter takes off for a staggering display which includes hanging vertically in the air before sliding backwards and downwards in a loop before resuming horizontal flight. In mid-December we bad a sad farewell to all our friends at Rebak, our base of five years, to head north for the last time to Phuket in Thailand. We shed a tear as we left behind each of the many small tropical islands that had become so much a part of our cruising life. Christmas and New Year was a social whirl with much beach restaurant music made by we sailors, many of whom were about to be parted after many years of jamming together. Happily, on the freighter which Amoenitas was about to join, would be the talents of our prized saxophonist and two guitarists. January saw us off to Myanmar accompanied by Brit sailing friends David & Heather from Milliways. On our previous trip around Indo-China together we had done our own planning and booked accommodation via the Internet as we went. This time it would be more difficult as there is little English spoken and the transport system is notoriously difficult to access and understand, with constant changes to schedules. We found an outfit called Santa Maria travel who turned out to be excellent. Instead of having 'joined at the hip' guides who went everywhere with you, we chose to have a local guide with driver and vehicle at each of the four centres we planned to visit. This worked extremely well. Myanmar, or Burma to give it back it's old title of the British colonial era, had only just entered a new era of what is hoped are political reforms whereby the stifling control of the army is being loosened but with a pro-army hierarchy in charge. 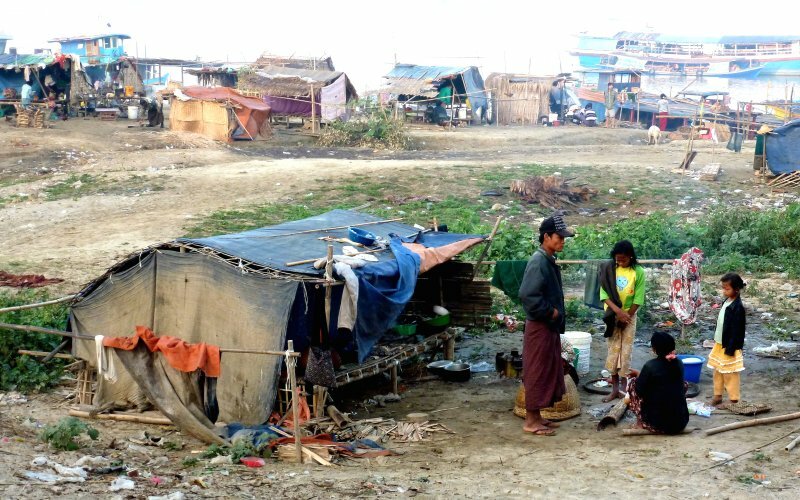 The generals are still there living in isolated luxury in the new capital they built for themselves midway between Yangon (Rangoon) on the southern coast and Mandalay in the centre of the country. Aung San Suu Kyi the world renowned pro-democracy activist and Nobel prizewinner had just emerged from house arrest and was beginning campaigning for elections due in April. This picture of her younger self (she's our age) with her father was widely seen discretely placed in homes, on cars and boats throughout the country. The one above was for sale at a market stall in central Burma. 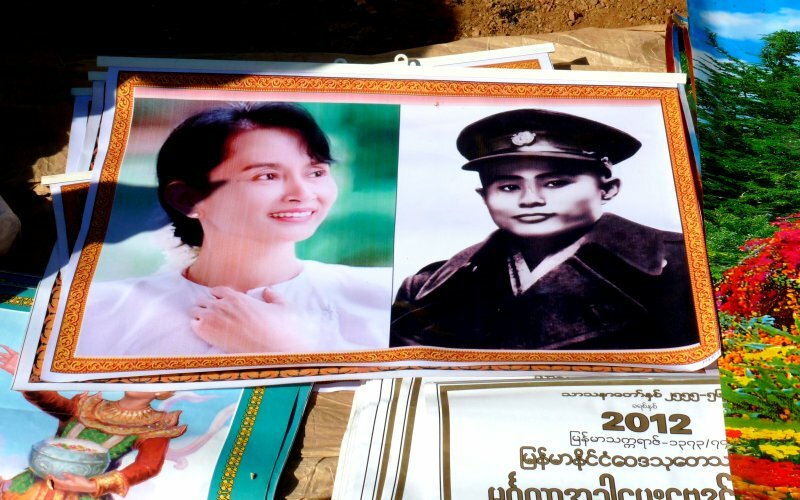 She is worshiped by the people who know her as 'The Lady' and will surely win the rural seat just outside Yangon that she is contesting. The big question is whether the others standing from the Pro Democracy party will succeed by overcoming the barriers put in place by the generals. If they do, they still have to overcome the measures to restrict change built into the new constitution such as uncontested seats in parliament given to the generals and their representatives. The world is watching with bated breath! Our guides always made sure we saw a wide selection of markets, all like this were stacked with an enormous range of beautiful produce at locally affordable prices. Would that we had found such a supply in Langkawi in Malaysia which in spite of a good growing climate and plenty of fertile land had far less to offer. You may just be able to make out in the picture the light brown patches on the faces of the women. This is a form of sun-block which is derived from bark from an oily pine tree that is ground to produce a paste. The first centre we visited was Bagan, around an hours flight north of Yangon in an aged BAe turboprop aircraft that had failed to sell well in more developed markets. In his days 'in harness' Dave used to travel up to Wharton, Lancs in the BAe corporate aircraft, when in winter he never really adjusted to the scary noise of the ice coating from the propellers being thrown against the fuselage as the plane descended into warmer air. Fortunately that's not a worry in Myanmar. 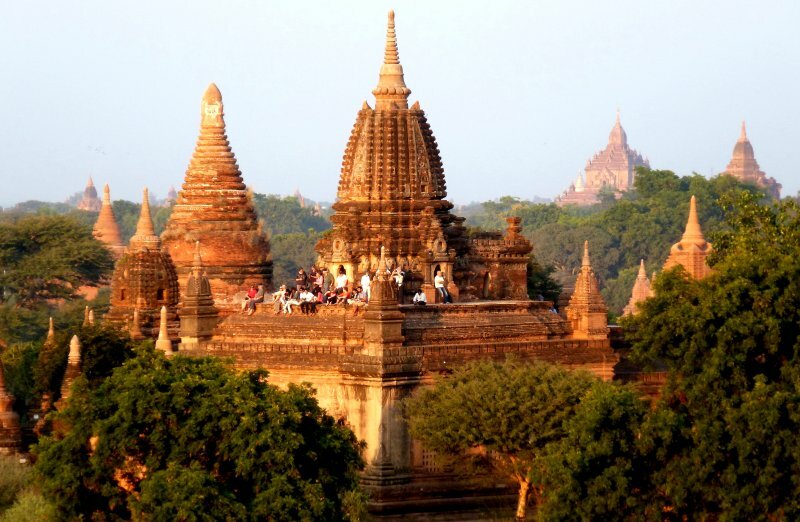 Bagan is a former capital of the country which benefitted from a Buddhist building boom of temples and stupas (burial sites) around 1,100 years ago. There are over 3,000 of them scattered over a relatively small area with nothing much else around. The local populace, largely dependent on the tourist trade, live in a town called New Bagan just outside what is now a heritage area. Most of the structures are in relatively good condition, given their age and have remained remarkably free of damage or graffiti. Many have large Buddha statues at their heart, often covered by gold paint or leaf with some also sporting wall paintings, often depicting Nats. These are spiritual beings which originate from pre-Buddhist, Animist beliefs that innocents murdered by evil doers were re-incarnated as benign good spirits. What is truly staggering is the vast quantity of artifacts and their relatively good condition after over a thousand years of apparent neglect. Our next centre was Mandalay of 'flying fishes' fame, right in the centre of the country on the enormous river Ayar Waddi (Irra Waddi in old speak). It is a huge sprawling industrial centre with a few small hills whose summits house temples with vantage points across the huge plains. The town is unremittingly grim but scattered with historical jewels in the form of temples and palaces. Again this was an old capital of the country. Everywhere we were housed in what was relative luxury, most of the hotels were of first world standard. This one in Mandalay however was in a teeming riverside district where even double glazing could not adequately dampen the noise of night time festivals that went on till the following dawn. Even more disturbing was the temporary city of shacks on the river bank, just over the other side of the street and largely concealed by a line of large trees. This housed thousands, maybe tens or hundreds of thousands of people largely engaged in the timber trade fed by barges coming down from the forests of up-country provinces. Their tenure was temporary as they were living on river banks that by July would be inundated by the rising waters fed by the SW monsoons. Where they went then and how they made a living was anyone's guess. The two Davids took to exploring this bamboo and plastic sheet metropolis, firstly just after dawn and then in the heat of mid-day. The inhabitants were very friendly and acquiesced to our prying lenses. 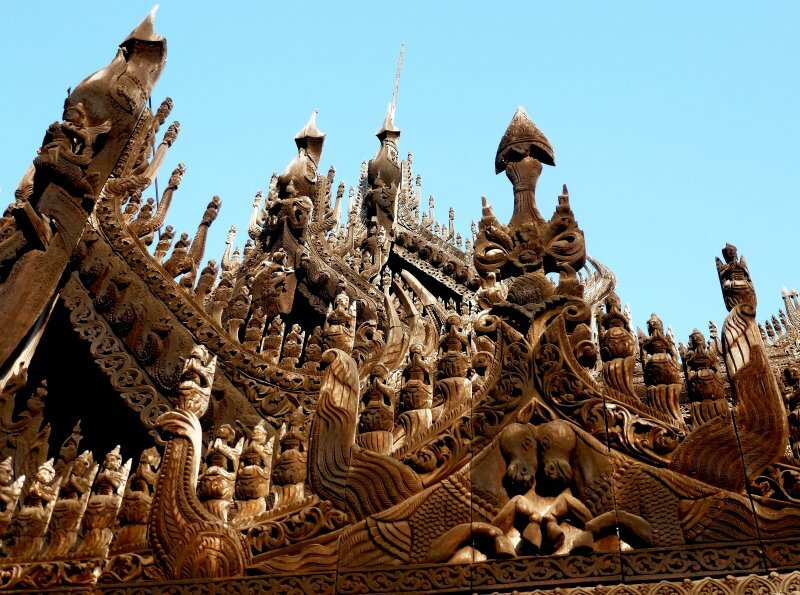 They appeared to be largely involved in making such things as screens and firewood, mainly from bamboo. It was also apparent that the womenfolk often played the major role in most of this activity, even including loading a truck with riverside sand by shovel. 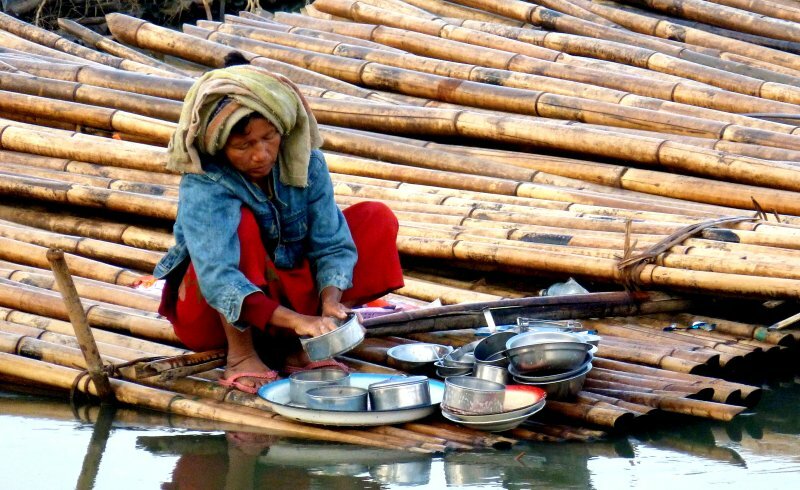 Again the lady has drawn the short straw in doing the washing-up, goodness only knows what the health implications are of using such an obviously polluted water source. At this point the river is over 2km wide with several large sand islands midstream. We spent a morning going upstream in a local trip boat run by a family of four who also lived aboard. Our destination was an enormous half completed tomb of solid brick around 300m square which had reached a height of around 150m before it was badly damaged by an earthquake and abandoned. Throughout the country we were to hear of major structural damage from earthquakes. In Mandalay we also visited the vast reconstructed palace of the Burmese kings which was destroyed in the 2nd World War by British bombing when it was used by the Japanese as their headquarters. The reconstruction was based on original drawings from UK museums and companies but sadly done to a very poor standard. Wandering around the extensive site, one was inclined to feel they should have made more of an effort or just not bothered at all. The entire ex-royal complex is now within a big military precinct such that we needed permission to enter for a short while only. Given that the military had ruled the country completely until quite recently, we were surprised how little we saw of them. Their barracks were numerous but there was little or no visibility of them on the streets. We only encountered one large convoy of them on the roads. That was probably because we could not travel long distances by road as with one notable exception, they were in such a poor state. The exception being a major two lane motorway that joined Yangon to Mandalay serving the new capital on the way. We travelled on its recently constructed concrete carriageway into Mandalay from the airport and were amazed how little traffic it carried. In the suburbs of Mandalay we visited a large teaching monastery complex at Mahgandhayone where several thousand noviciates were housed in large dormitories built with funding from charitable sources. 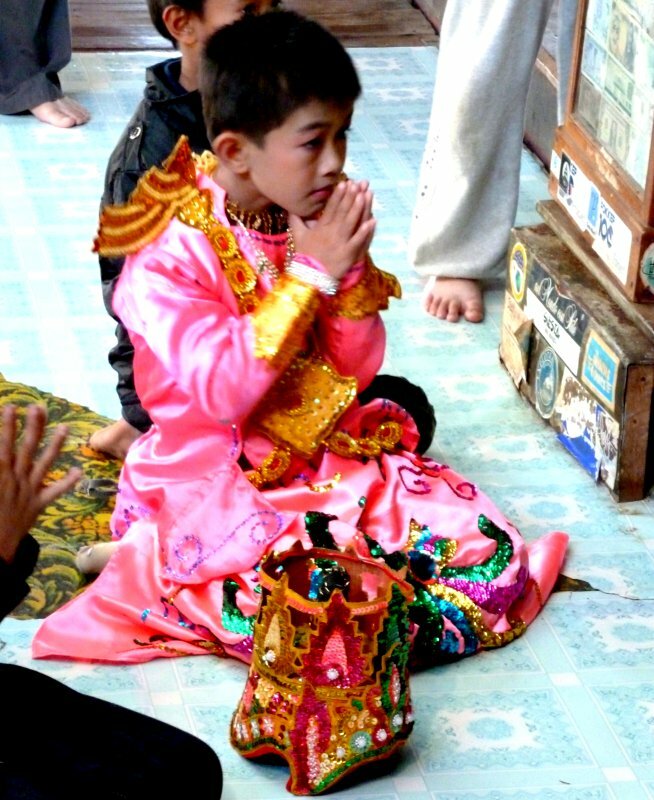 Most boys of about ten years of age upwards spend from a few weeks to several years in these religious teaching establishments. There is also tuition of a wider range, some students staying on to become monks. Here the young lad is the front of a short line of compatriots of a similar age, waiting along with similar groups of varying ages to go the the main meal of the day at noon. He carries with him his feeding bowl that he will return to the dormitory with filled with packets of crisps, sweets and other junk food, to see him through to the next noontime feast. Couldn't resist this transportation picture. 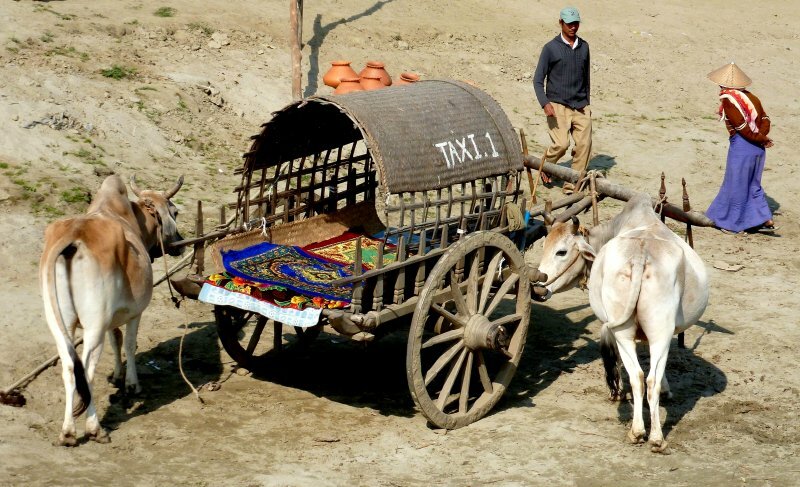 It is not entirely fanciful as horses and bullocks form the mainstay of rural transportation. In our hotel in Bagan we would hear the constant clatter of hooves way into the night with only minor incursions of motorised traffic. Our tour operators had arranged a diverse range of activities for us, including a stay at Kalaw, a hill town on the Shan Plateau. 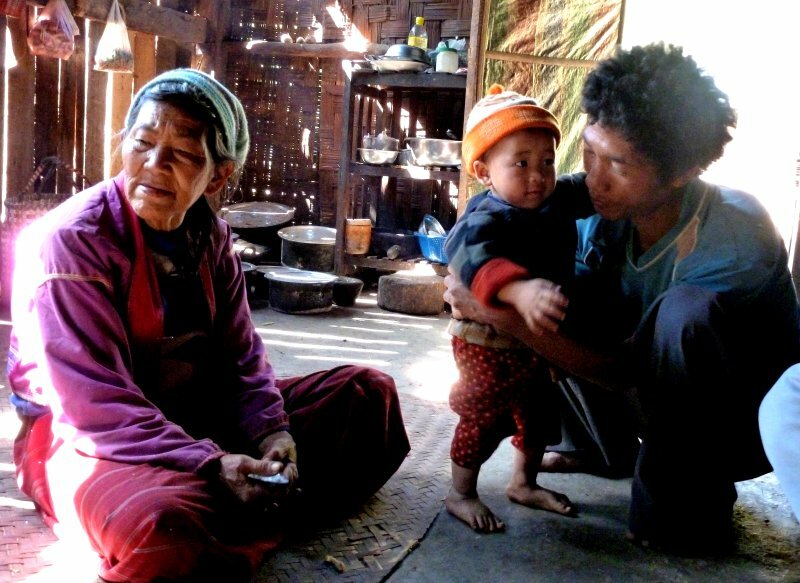 Generally we were relieved to be a few hundred kilometres north of hot, steamy Thailand and away from Yangon on the coast, at a much higher altitude. The hill country was perhaps a bit too far the other way, as we froze when the sun went down and retreated to huddle under a substantial thickness of bedding in almost unheated rooms. The next day, like every other during our stay in the country, dawned to a clear sky which remained unsullied throughout the whole day. We gathered they did not expect any rainfall until July. Our lovely guide Than Tun was only marginally younger than us but set out gamely with us on a four hour trek through native bush up and down a steep slopes which culminated in a valley with numerous farms growing a wide variety of fruits and other crops. Agriculture seems to be based on family units cultivating around 2-4 acres of land which they lease from the government at a rent of around 15$ a year. Than Tun was such a kind and humane character that after only a few of these trips he had built quite a relationship with the farmers such that he brought in medication for them and distributed gifts passed on by we tourists. Above, we were in the two storey home of an extended family who grew mainly oranges. The samples they brought us tasted absolutely fabulous (excuse the plug for Jennifer Saunders) and will form a standard by which we will judge all future fruit of that ilk. Than Tun's story was like many we heard in Myanmar. A bright lad who made it to university to read mechanical engineering but the teachers and other spies singled him out as a less than compliant, free thinker. Expelled from university he eventually got a job with a UN agency testing water standards, not that rewarding when warnings of problems to the authorities fell on deaf ears. Now he derives a living from guiding walks and shepherding small tourist groups like ourselves. He pointed out his modest home just outside Kelaw to us, just a wooden shack no larger than our garage back in the UK, on a small plot where limited crops could be grown. After his three nights away with us, he took back for his wife a present of some special wood to light the fire with. Such is the disparity in living standards in this modern, interconnected world. In this case much of the blame could be laid at the door of the military. Whatever his condition, he was a truly gentle and humble man, generous to a fault and devout in his Buddhist faith. A role model for us all. 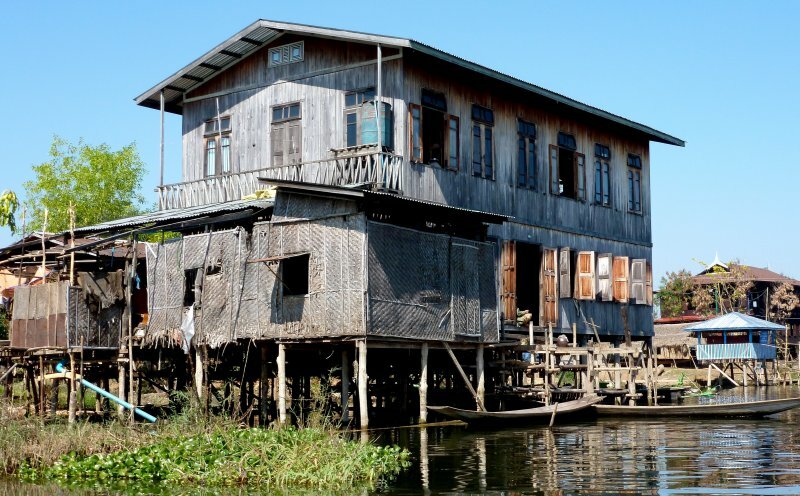 Our next base was on the Inle Lake, a shallow tract of water some 75km long and 25km wide where houses are built on stilts and fields of crops float tethered to the bottom by bamboo stakes. Even the hotel we stayed in was all on stilts. 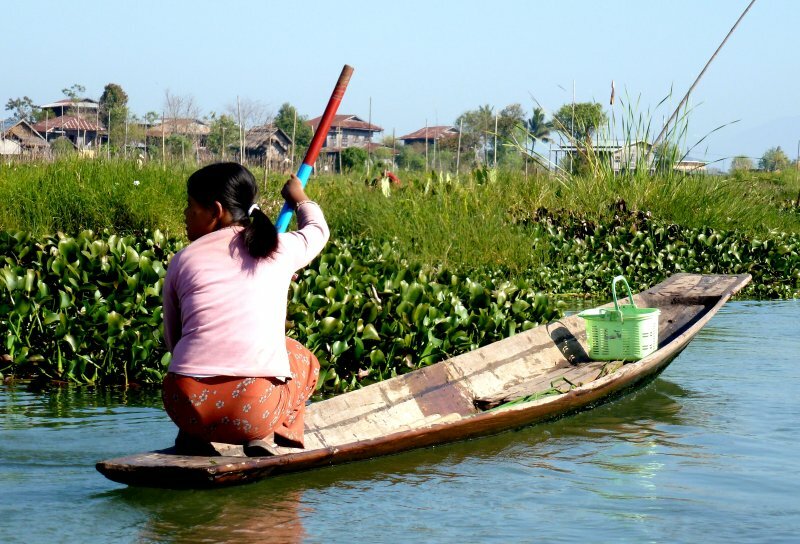 There is a local version of the Thai longtail craft on the lake which has a universal drive on the transom driving an external prop shaft which retains the freedom from an underwater gland and allows the engine to be fixed. Most boats are powered by the ubiquitous Chinese, single cylinder diesel engines, cooled by an evaporator and usually unsilenced! Everything around the lake moves by small boat, so to go shopping, this young lady takes off in her sporty stripped down model. It must take a lot of practice and skill to perch on the transom of such a small craft. 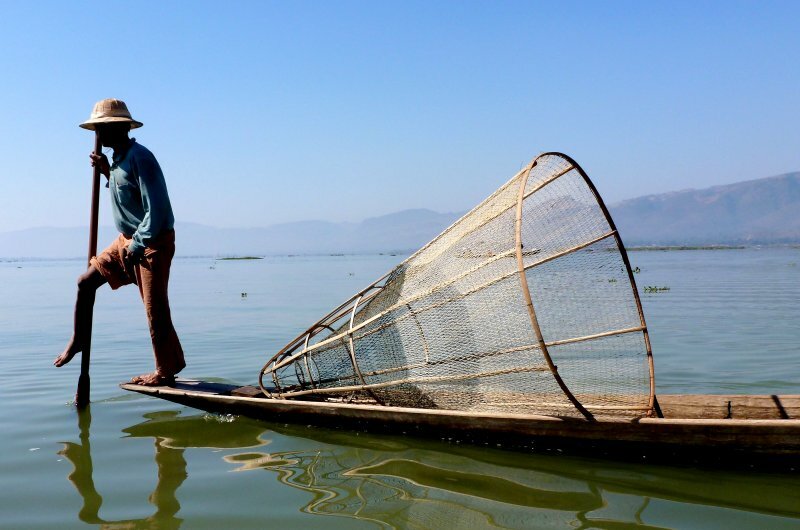 Above is the iconic view of an Inle fisherman with one leg wrapped around an oar. They are famed for this style of propulsion which was adopted to leave one hand free for net handling. They are purported to have one leg larger and more developed than the other. We aren't sure whether this leads to them walking round in circles on land. Whilst on the lake we visited the Ngaphechaung monastery, known as the Jumping Cat Monastery because cats they keep there are trained to leap through small hoops held over a metre above the ground. We know that's so as we witnessed and photographed a performance. 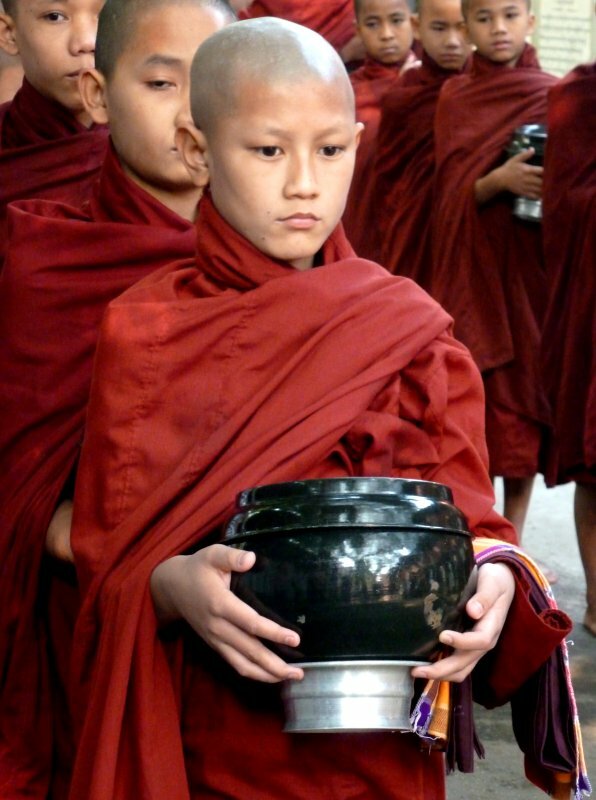 We also arrived when a young man was undergoing his initiation as a novice monk, looking angelic in a colourful costume surrounded by his siblings in similar garb. From the lake we flew back to Yangong for our last day of full-on exploration of the commercial capital of the country. 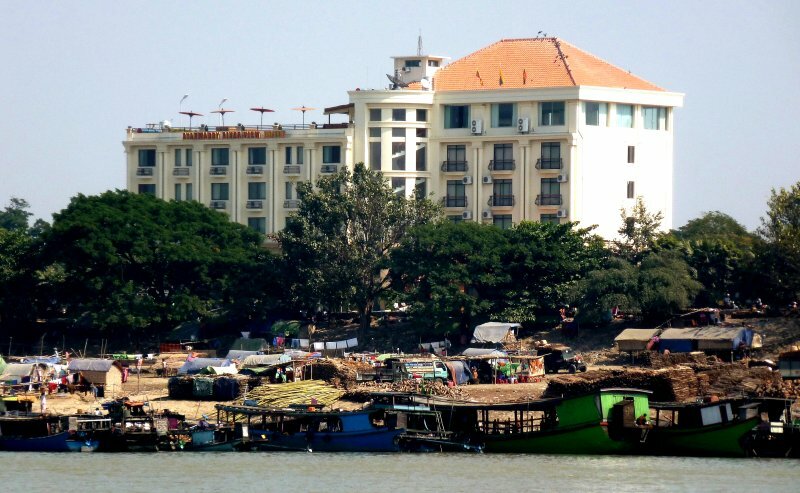 Much of the river waterfront is still dominated by large buildings of the colonial era, one of which the Strand Hotel is run by the government as a museum and sales outlet for paintings and up-market souvenirs. 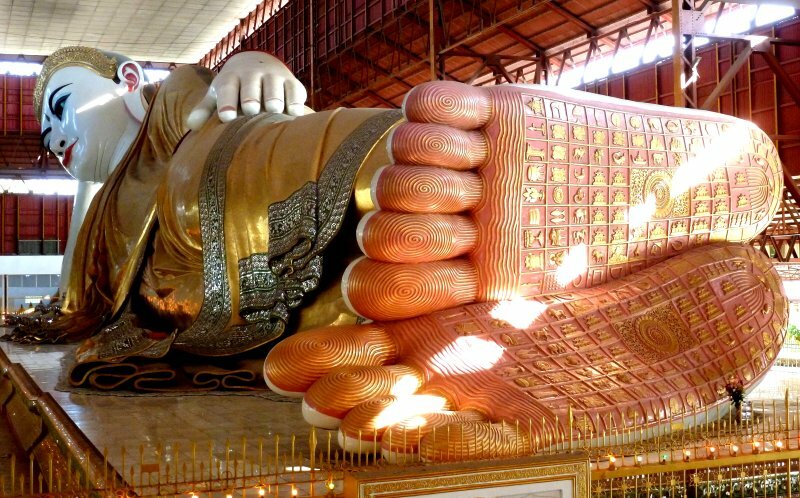 This large and rather splendid recumbent Buddha statue was diminished by being housed it what appeared to be a railway station-like structure, all steel beams and pillars. Dave did however manage this shot with an unobstructed sightline. 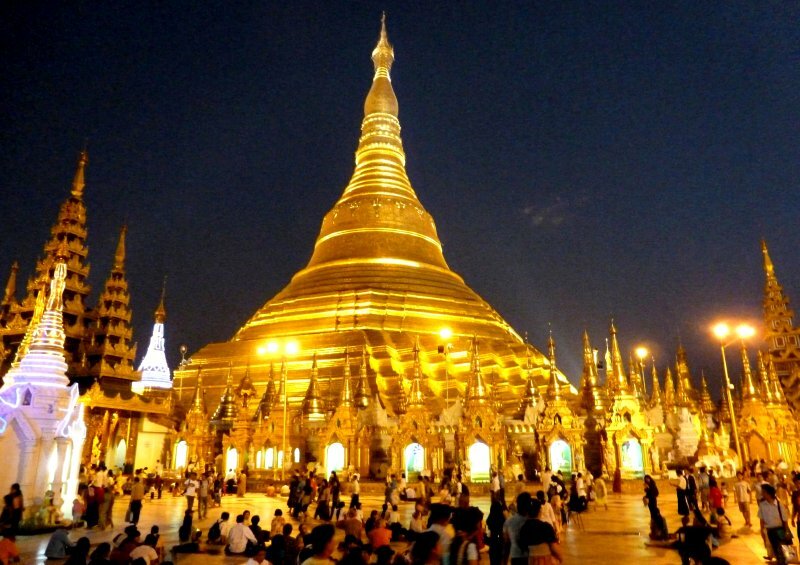 Undoubtedly the highlight in Yangon is the huge Shwedagon temple complex on a large elevated area near to the centre of town. There are dozens of temples, monuments and religious structures there, all dominated by the central gold covered dome. On its very top, mounted on a structure known as the umbrella, is a huge diamond, apparently one of the biggest in the world. We were taken there just before dusk so had the advantage of experiencing the site in the warm glow of sunset as well as illuminated by a myriad of lights after dark. The surreal effect was only diminished by the over zealous application of flashing strings of LED lights to any object low enough to mount them on. It was a captivating experience which kept us enthralled for far longer than we ever imagined. With much reluctance we dragged ourselves away in the knowledge that this was the last event of what had been a short but memorable tour of the country. Back in Phuket we had around three weeks to kill before we had to start to prepare Amoenitas for transportation aboard the freighter. Naturally we returned for the fourth time to our favourite Similan Islands about 75nm to the NW with old Brit cruising friends Alfred & Rosemarie on Iron Horse who we first met in Trinidad twelve years ago. Dave & Alfred have been diving partners for some time whilst Di & Rosemarie love the snorkeling. There the water is warm at around 32°C and the visibility is in the order of 40-50m. On our very last dive off the most northerly Similan Island (#9, Similan meaning 9 in Thai) we stumbled across this large, mature Hawksbill turtle which was in no way fazed by the presence of two large, black, rubber clad objects following him/her. Such was the level of disinterest we all three swam alongside for more than ten minutes, we taking lots of still and video pictures. Meanwhile, unbeknown to us the girls were watching from above through our underwater viewing box so that our exciting news on surfacing had been forestalled. Following our return to Phuket we set about preparing Amoenitas for shipping. In addition to taking the sails off we had to wrap winches and other moving gear to protect against sand blasting. This because the Red Sea is renowned for headwinds of up to 35kts which with a boat speed of 15kts results in a sustained blast of up to 50kts of sand and dust loaded air over the deck. Added to which we were warned that when the Egyptian customs come aboard at Suez, they will pilfer everything portable or easily removable such as shackles from the deck. 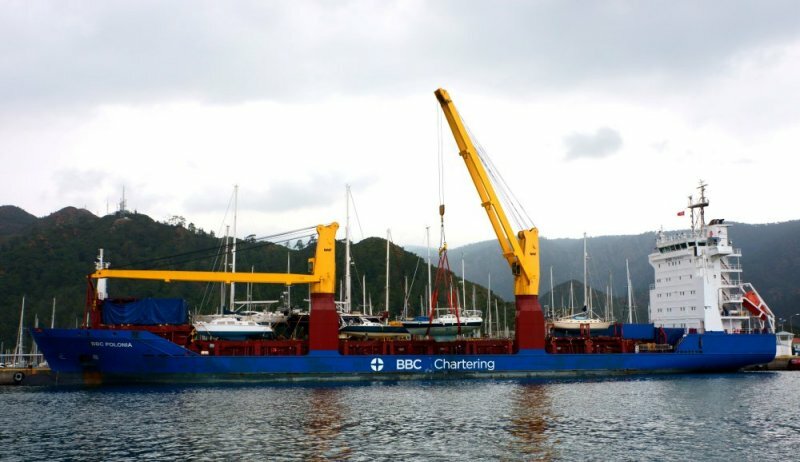 The last few days before we hauled were frustrating as we were all ready but the MV BBC Polonia was delayed bunkering at Port Klang and when she did arrive it was at the top of one of the biggest spring tides of the year. With peak currents of up to 3kts along the hull, there was no way the diver who had to locate the strops underwater could maintain his position. The loading schedule that called for all sixteen boats to be taken aboard in two days could not be achieved, so there was a further day's delay for us and two days for the tail-end boats. 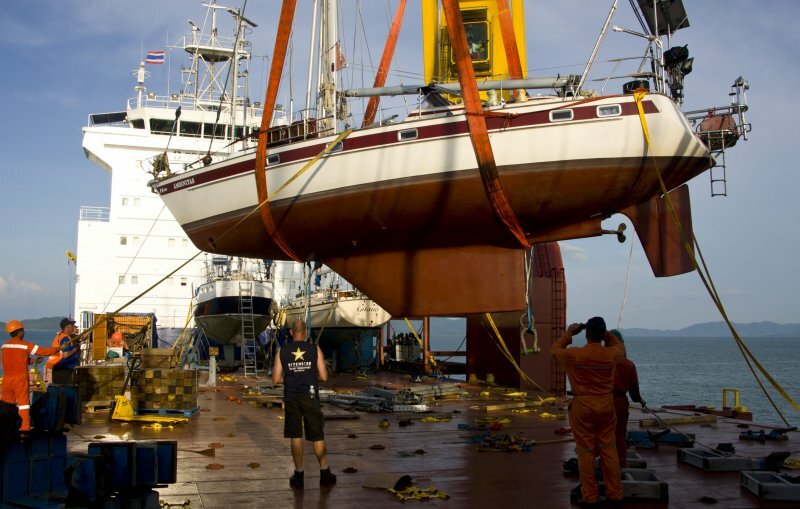 The whole business encompassed a wide patchwork of players, the boat being German owned, registered in Antigua, chartered by a Dutch company, crewed by Filipinos with Ukrainian officers, whilst we communicated through our agent in Southampton. Its amazing it ever happened. Finally the Polonia set off three days late for Galle in Sri Lanka where they were due to pick-up four heavily armed Russian security staff. They were also due to liberally spread razor wire across the decks to slow-up boarding pirates. Our next decision was how to use the sixteen or so days before we took delivery of Amoenitas in Marmaris. We had considered a stop-over in Sri Lanka but settled instead on seeing our niece, Kathryn who lives with her family in Dubai (one of Dave's sister's twin girls). It was great to see her and David plus their three children for more than a fleeting few hours and also an interesting place to visit. It was weird to travel along wide modern highways with huge high rise buildings on one side and nothing but sand, rocks and the odd bit of scrub on the other. There was also the odd roaming camel scattered here and there. We explored much of the old town and creek area on foot but aside from the extensive range of mega shopping malls, there appeared to us to be not a lot to do there. The picture above was taken from the 140th floor of the Burj Khalifa tower, currently the worlds tallest building but about to be overtaken by one under construction in China. 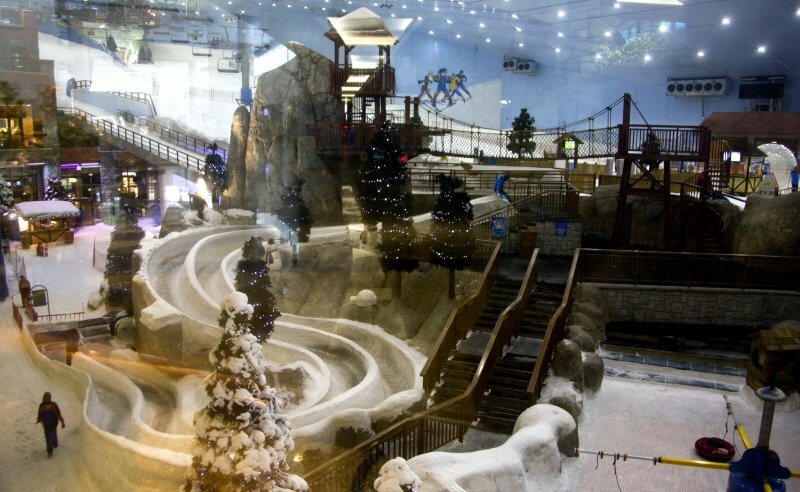 One thing you could do at the Emirates Mall, in the midst of a hot desert, was ski on an indoor slope complete with man made snow. 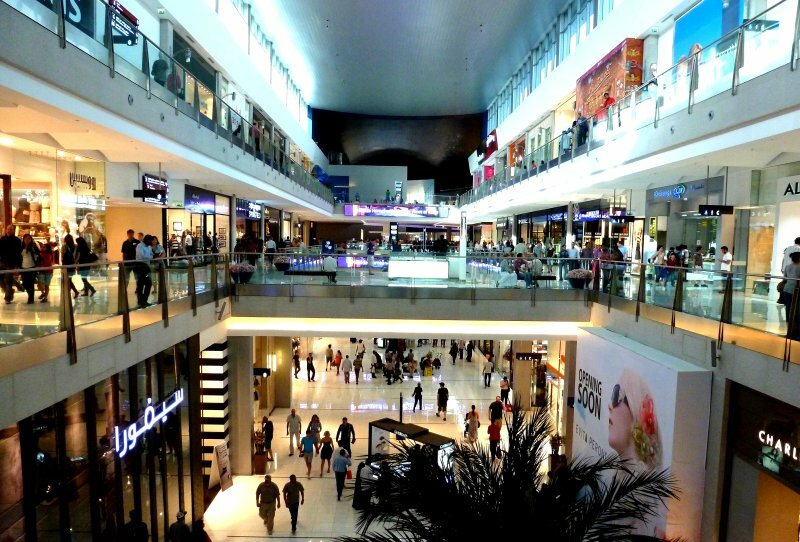 Down the road at the Dubai Mall, would you believe the world's biggest, there is an aquarium two storeys high with one side open to public gaze which held thousands of fish, predominantly Jacks but including, giant Napoleon Wrasse, huge Groupers, Sharks, Rays, etc,etc. The whole place seems to be an ecological nightmare and just how sustainable it will be as the oil starts to run out is anyone's guess. Despite the enormous scale of investment in magnificent roads and pavements, often finished in marble, there was one dirty secret....POO. 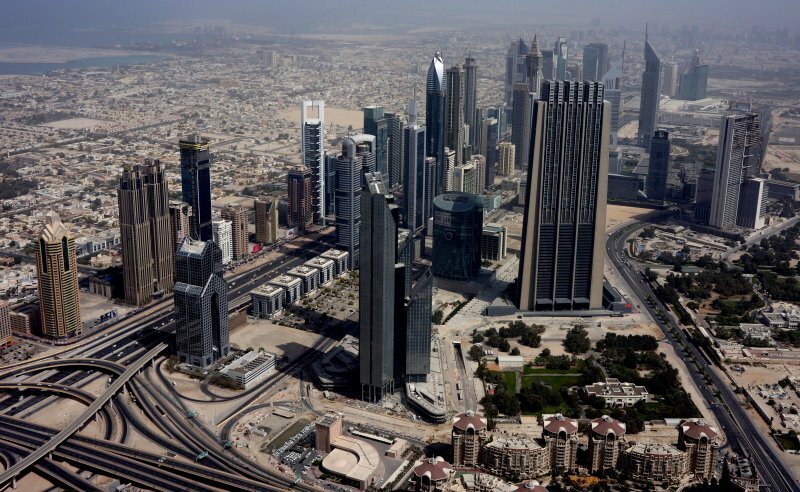 They obviously have neglected to connect most of the shiny new buildings to a sewage system with the result that hundreds, maybe thousands of 10,000 gallon road tankers are collecting sh1t and depositing it on the desert some distance from the city. Most of the day they are in a queue several kilometres long, waiting to discharge. It may even be a 24/7 process. 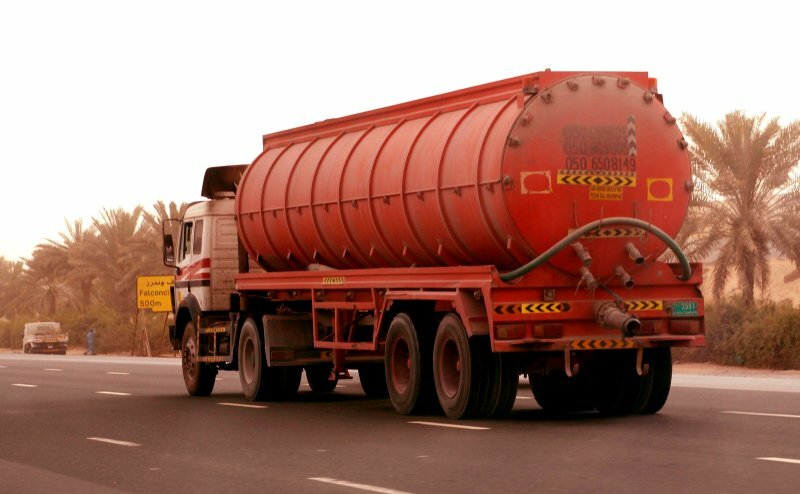 We were alerted to this by cruising friends who told us to check out the posting under 'Dubai sewage trucks' on YouTube. If you select the 3rd item down you can see for yourself the extent of the operation. Strangely our relatives that live there had never heard of it but having seen the video clip we were all on the lookout and sure enough we counted tens of them in a few minutes on the main road out to the desert. We are proud to have introduced them to a new in-car family game whereby points are awarded to each new sighting of a poo tanker! After a lovely week in Dubai we flew on to Istanbul where we spent a further four days exploring. We were fortunate to get a hotel right in the midst of the main tourist attractions so were able to visit all the major sites on foot, starting when they opened at 9am before the hoards arrived. It is a charming city, if a little run-down and dated. 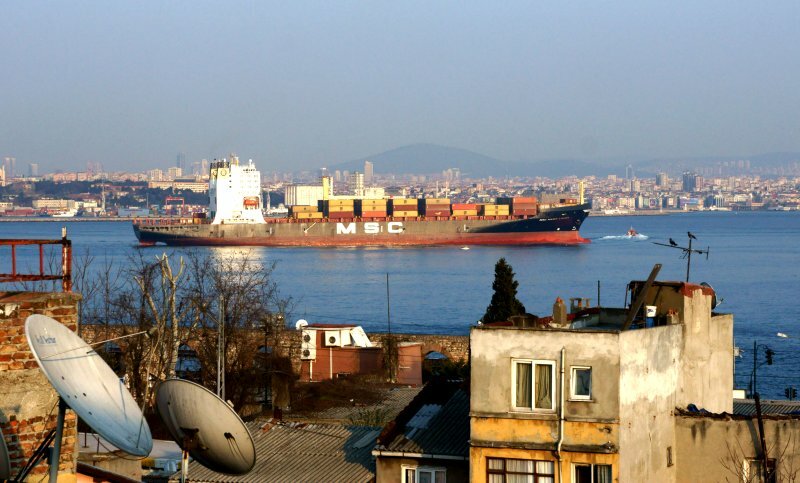 The nature of the housing stock can be judged from the picture below, taken out of our fourth storey bedroom window which looked out over the Bosphorus. On the negative side, after the clear pavements of Dubai, we were back into our SE Asia mode of footfall watching to avoid tripping over obstacles or falling into deep voids. There was one other annoyance that we hadn't expected....persistent touts outside shops attempting to drag us in to buy carpets, leather jackets, food, etc but mainly carpets (memories of the old credit card advertisement featuring Rowan Atkinson). The up-side, if there was one, was that they were generally very polite and sometimes humorous. We often heard the phrase "Can I help you spend your money" to which the reply was "I already have a wife to do that". The prize however went to the guy who said "Hello brother of another mother", there's just no answer to that one. We went to the Grand Bazaar which encompasses many kilometres of shops arranged in long alleys, only to see a long, long line of guys outside the shops ready to engage any passing stranger. 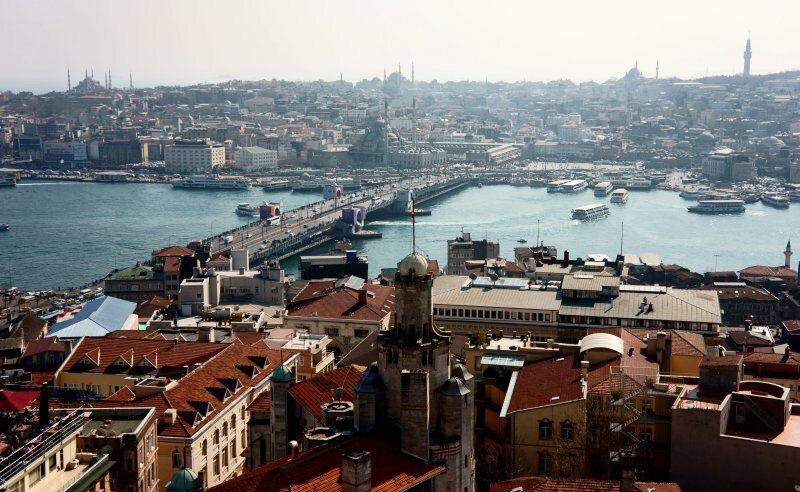 We crossed the Galata bridge below on one of the modern trams and climbed the hill to the Galata Tower which afforded a splendid view across the city with the Bosphorus to the east (LHS goes to the Black Sea; RHS to the Mediterranean) and the arm of it called the Golden Horn passing under the bridge to the SW. It was obviously a popular vantage point as even a gull came to enjoy it with us. On the skyline below is the Hagia Sophia to the left and Blue Mosque in the centre with their ballistic missile-like minarets. 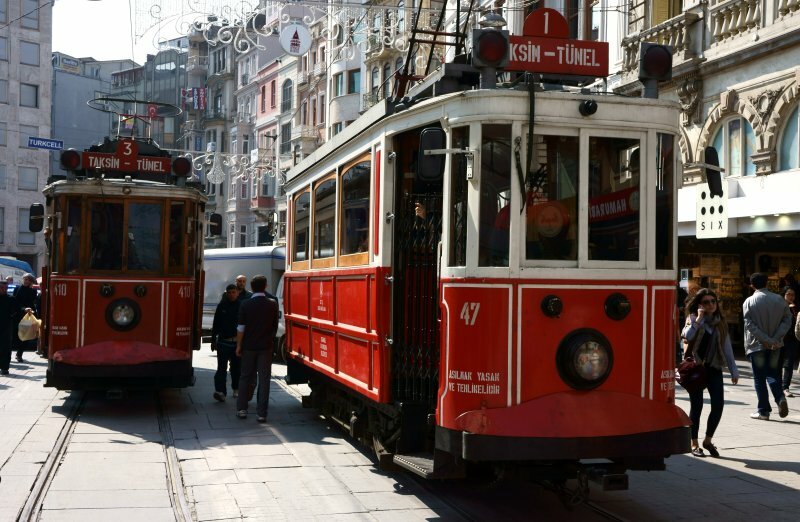 Also atop the hill beyond the tower is the 2km long Tarlabasi Boulevard terminating in the large Taksim Square. This area is known as the New Town but is served by a charming old tramway system. There were endless shops offering what we have come to feel is the useless trivial, ephemera of the modern consumer society. Perhaps the feeling is born of the seafaring life where with limited storage, every item aboard has to compete for a place and taking some other item in requires that something else may well have to be ditched. A roadside sign by an anonymous looking doorway could not prepare us for the vista we were about to behold at the foot of a long flight of stairs, the Basilica Cistern. 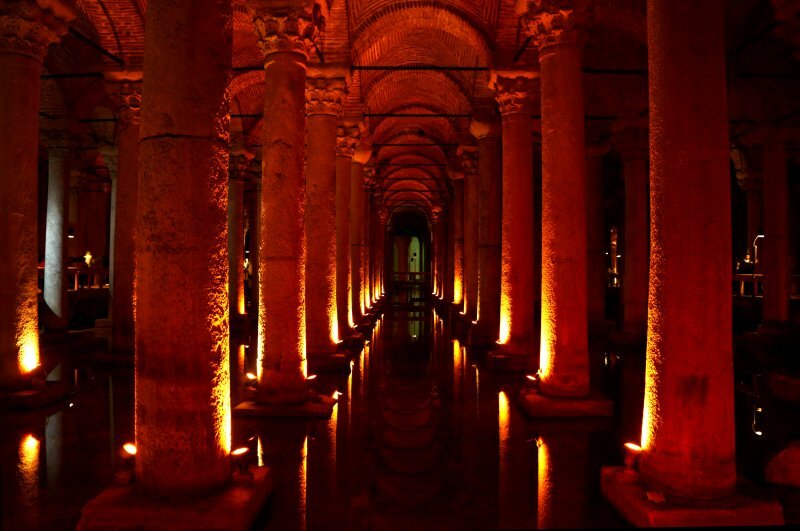 Built to store water from the Belgrad Forest some 19km away, it was constructed in the 6th century at the height of the East Roman Empire. Within, it gave the impression of being much bigger than the 140m long by 70m wide dimensions quoted. The enclosing dome is supported by 336 marble columns 9m high arranged in 12 rows of 36. The walls are of 4m thick brick, rendered with a special waterproofed concrete lining. A mere 1500 years later it still seems a formidable engineering achievement, begging the question of how much of the basic infrastructure we are building now will be around looking so good after a similar time. From there we went on to see what was definitely the highlight of our exploration of this ancient city, the Hagia Sophia. It is the 3rd bearing this name built on the same site, the first being consecrated in 360AD. 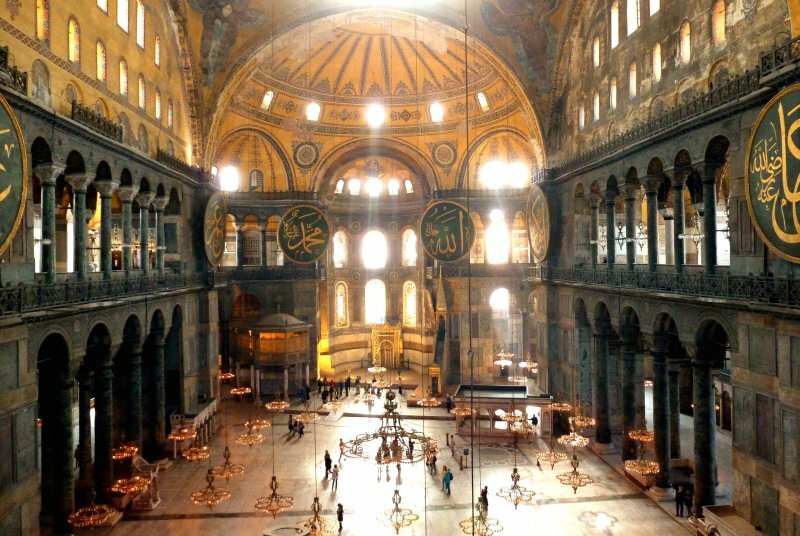 This one, completed in 537AD after being constructed by 1,000 master craftmen and over 10,000 unskilled workers in just 5yrs 10mths and 24days began its life as a church, was converted to a Mosque and is now a museum. Some might say that that should be the fate of all religions too! 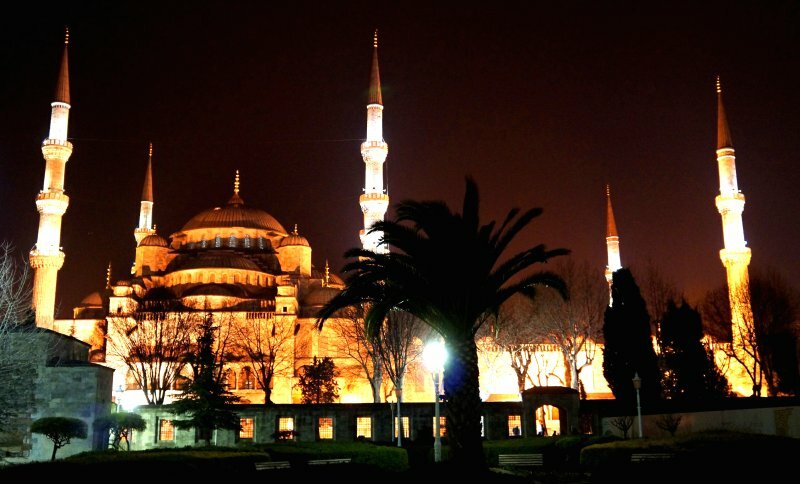 After the fall of the western Roman Empire, in 330AD, this city then known as Constantinople, had become the undisputed capital of the Empire with its three principal religious centres here and in Rome and Jerusalem. At the time of the building of this monument, this cradle of civilisation in the Eastern Mediterranean was known as the Byzantine World. We are just coming to realise now that our cruising of the Middle Sea is going to be a massive learning experience that classroom history lessons could never have prepared us for. There are two other architectural masterpieces we visited in this confined quarter of Istanbul, the Blue Mosque below which always seemed most impressive by night and the immense Topkapi Palace of the emperors overlooking the Bosphorus. The former is still an active Muslim place of worship and the latter a rambling collection of rather nondescript buildings within an impressive wall that house an extensive harem, treasuries and all the other paraphernalia of governance. Our four days of intensive exploration of Istanbul at an end, we dragged our weary limbs aboard a flight to Dalaman some 90km away from Marmaris where we would wait for our ship to come in. We set ourselves up in an apartment with three other expectant crews for what turned out to be a full week's wait. At the last moment the vessel deviated to Crete to bunker from a tanker close to the shore and then had a problem with their anchor windlass. The great thing was we could follow progress on the Internet anywhere and at any time on our laptops, Di's i-Pad or Dave's fab HTC Desire smartphone. You can try it yourself by entering the name of the vessel followed by 'AIS' in a search engine (eg : BBC Polonia AIS). There are pictures of the vessel, info on its route and a track of where it is which is updated every couple of minutes or so. Only one catamaran had sustained damage during the shipping, not only did the the antennas get swept off the mast by the crane hook when loading but one keel was damage by the pounding that the boats suffered in heavy seas. Amoenitas was in fine fettle, our stripping and covering had worked well but inevitably there were traces of fine Red Sea dust everywhere. Sadly, one crew had omitted to shut a hatch resulting in visits from and possible occupation by, the ships rats. Within a short time we were anchored off a Mediterranean beach beside the town. Don't get too jealous, its 18°C by day and 10°C at night which is quite a change from 34°C most of the time. We are enjoying the cool. Not sure how Amoenitas feels in 18.2°C water rather than the 32.5°ish she is accustomed to. She's probably a few mm shorter. 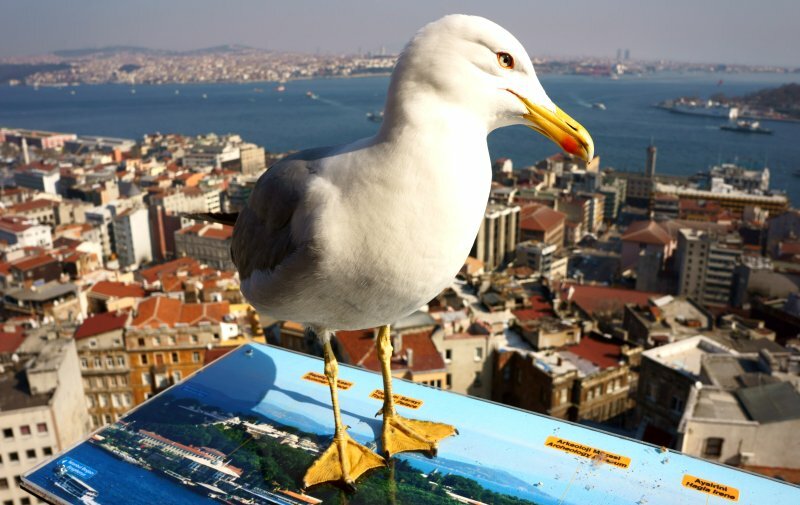 Already Turkey is looking like a fabulous place to cruise with masses of history and culture to absorb. The Med diet is going down well too, lovely fresh bread, olives and cheese to die for. 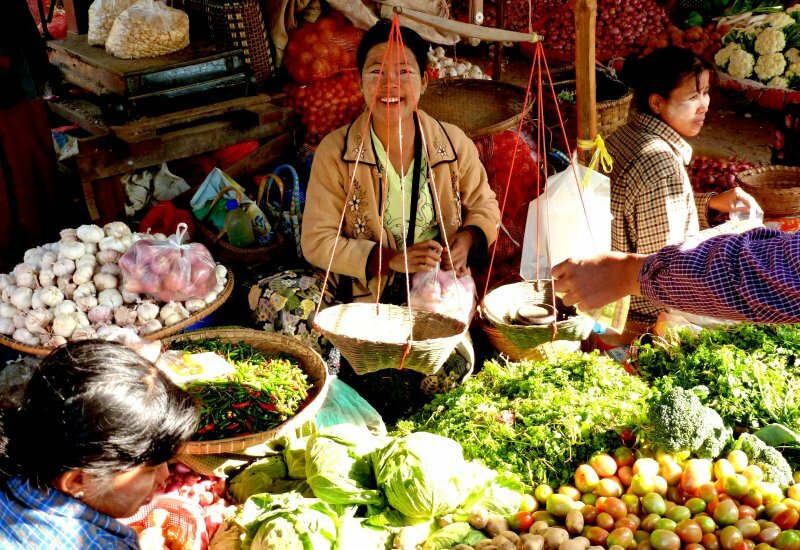 There are splendid farmers markets with hundreds of stalls offering an immense range of produce of a standard way beyond anything SE Asia had to offer and very cheap. So, its back to the old plan, not to have a plan. We are within a couple of months sailing from Home Waters here so will take every year as it comes.